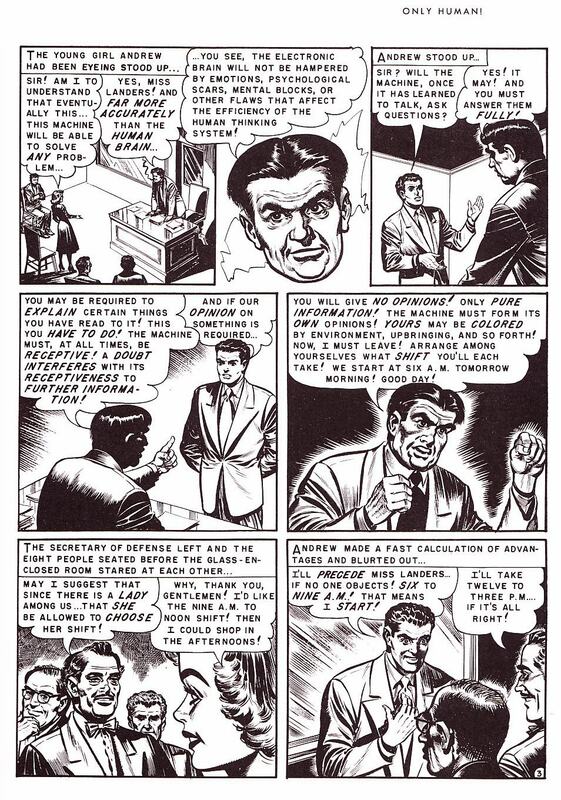 EC Comics is a legendary name among comics readers, famed – sometimes infamous – for some of their works which would contribute to the baseless moral panic about comics corrupting the youth of America and the imposition of the comics code which neutered many potential stories. Of course the fact that the censor hated them means we loved them all the more! Fantagraphics has been publishing a handsome hardback series collecting some classic archive material from the iconic EC Comics stable (which has brought us other volumes such as Corpse on the Imjin, ‘Taint the Meat and others so far). 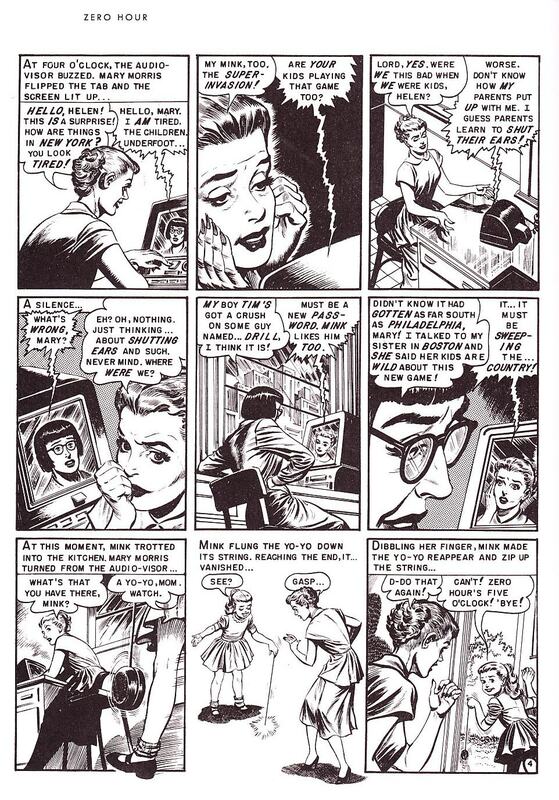 This new collection features the work of the great Jack Kamen, who was introduced to iconic publisher William Gaines by the equally iconic Al Feldstein. 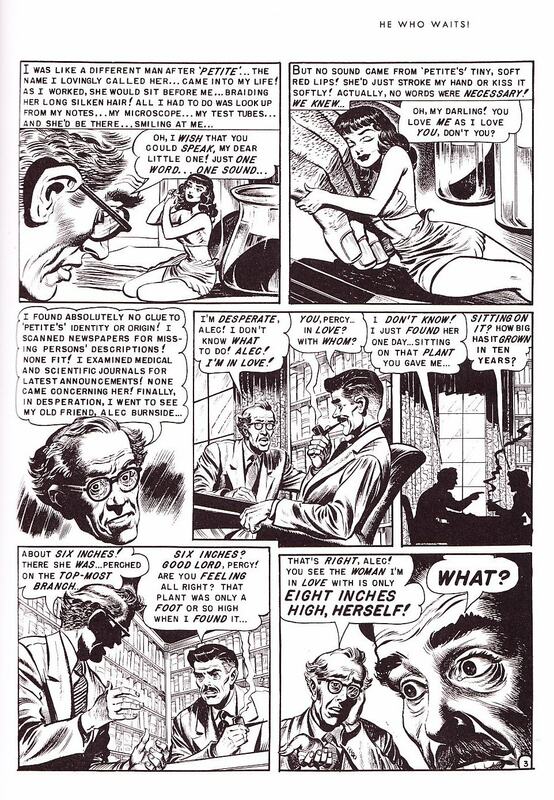 EC published all sorts – romance, crime, science fiction, horror – and Kamen cut his comics teeth on the romance tales, soon becoming noted for his expressive, detailed style, the character he captured on the faces of his subjects and his depiction of beautiful women. It wasn’t long before he was mostly on the more fantastical subjects and 50s style sci-fi and horror by Kamen is what we have in this, the latest of Fantagraphics’ lovely EC library hardbacks, with stories by Gaines, Feldstein and a very young Ray Bradbury (surely not just one of the finest science fiction writers of all time, but one of the finest American writers in any genre). These are all very much short stories in the EC classic mould, only a few pages each, most often featuring a male and female character either sneakily plotting behind one another’s backs or frequently in cahoots to commit some act of illegality or immorality for their own selfish benefit. And like, say, Dahl’s Tales of the Unexpected, there is almost always some sort of sting in the tale here. A jealous, scheming wife is sure her husband is cheating on her, duping her with a robotic duplicate while the real version of him is off with another woman, in a story adapted from one of Bradbury’s Marionettes Inc tales (which also feature in his landmark short story collection The Illustrated Man) where a secretive company manufactures detailed robotic doppelgangers. A scientist creates a special process to freeze humans and animals for long-range space missions, and sees in it a chance to stowaway his attractive assistant, ready to defrost in the distant space colonies, far away from his wife, but of course something goes wrong. And that’s a recurring theme here – schemers come up with devious plans, husbands plan to cheat on wives, femme fatales (and what femme fatales or swooning love interests Kamen draws) plot to murder for money, revenge and love, sometimes, as in a couple of young lovers who yearn to be married but are too poor, good people are lead astray to do one seemingly clever crime, but every time something will happen, each time that sting in the tale and the moral reminder (hey, this is the 50s) that in the end crime doesn’t pay and that everyone will get their just deserts. There are some exceptions to this ‘house style’ though – a scientist finds a perfectly proportioned miniature woman in his lab, only a few inches tall and the lonely bachelor falls in love so heavily he uses a special potion to shrink himself to her size to live with her, but love has blinded him and there is a secret about her genesis he will learn too late. 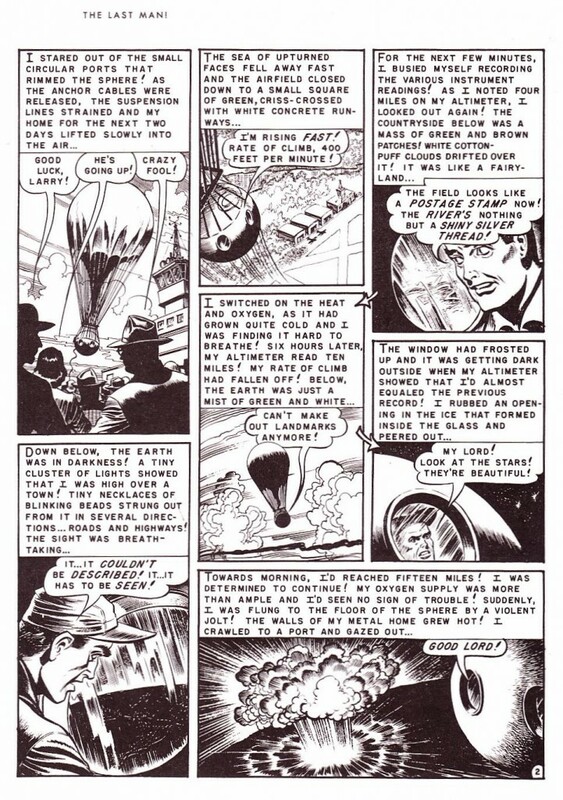 Or in another Bradbury adaptation, the titular Zero Hour, parents see all the kids in their neighbourhood playing a game together, borrowing items from the houses to construct something as they play a game invented by their imaginary friends – a game about invading the world sneakily, by using children. But it is just a harmless child’s game, isn’t it? Isn’t it…. 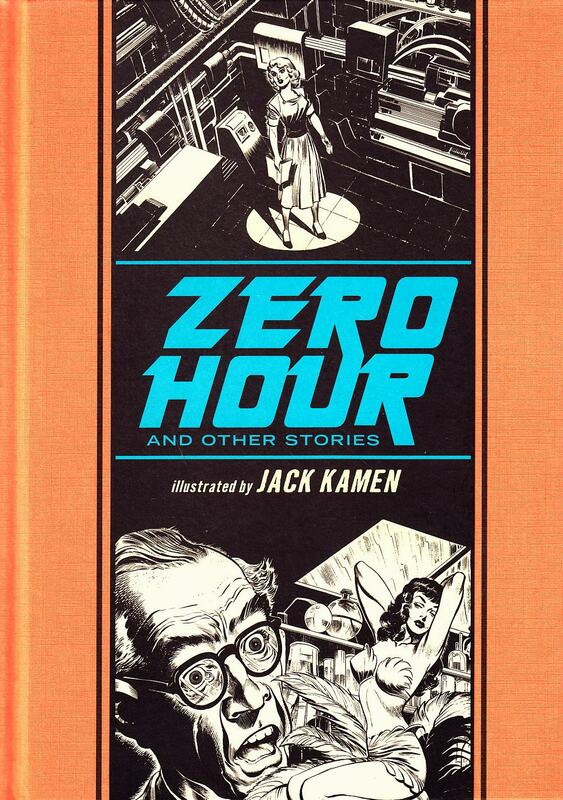 Throughout all of these short tales though Kamen’s artwork is gorgeous – the lurid, leering expression of the villainous man, the seductive and yet somehow simultaneously vicious glance of the scheming femme fatale, the wonderfully captured expressions of shock and surprise on faces as the dénouement is revealed to them, it is a pleasure to admire his craft. It’s very much of its time though – not just the style of storytelling, but of that early post-war society that it came from. The casual sexism in many stories will glare out at modern readers – in one tale where a group is asked to take turns working 24/7 on a science project the only woman in the group is asked by the gentlemen to go first and asks for the morning shift so she can have “time for shopping” in the afternoon. This is also an era of the nuclear family, the husband and wife roles very heavily defined (the woman is in the house if married or a seductive secretary or lab assistant if still single and young). And the science in the science fictional stories is often laughably silly to contemporary readers (to be honest it was probably pretty inaccurate even to any half decently informed reader of the time too), but that doesn’t really matter, it’s the stories and that wonderful 1950s artwork that are centre-stage here, and we can’t apply modern mores to stories crafted some sixty odd years ago. I find it highly amusing (in a bitter and dark way) that the same Muslim countries making vociferous complaints against the shagwit bigot preacher Terry Jones and his frankly stupid idea of burning a Qur’an are exclaiming loudly how it is insulting, provocative, derogatory and disrespectful of their culture (which it is) while showing their displeasure by doing what they usually do and burning flags and effigies. Do they see the irony in this? Does it percolate into their equally bigoted minds that perhaps they infuriate other cultures by mass burnings of national flags and effigies of people they’ve been told to hate? Nope, they don’t because like most such idiots (of any type, creed or any other affiliation) they only ever see the other people doing bad things, not them, oh no. Meanwhile I read that in Edinburgh a group demonstrated outside the US consulate. Now I can understand they are not happy, but I wondered what they thought would be achieved by demonstrating outside the US building? I mean this isn’t an action taken by the US government; in fact government officials have gone out of their way to condemn the 9-11 anniversary book burning as a stupid and disgraceful act and also tried to appeal to the reverend on patriotic grounds, pointing out that his ill advised actions could lead to a groundswell in attacks against US forces overseas. To no avail. So what did the group protesting outside the consulate here expect? “We have asked the American government to arrest this man, he is causing anti-Muslim hatred and I cannot believe nothing has been done,” commented one of the organisers, Mohammed Asif. Er, what? Rev Jones is clearly a bigot and intent on provoking more relgious hatred and, let’s be honest, anyone who burns books (religious or any other kind) is a barbarian of the first order in my opinion, but while what he’s planning may make him an uncivilised hate-monger he’s not doing anything illegal and he is free to express himself, even if he expresses himself as a totally bigoted arsebag. Guess what, that means you can’t gag him by arresting him. I despise what he is doing but calling for him to be arrested because you dislike his (legal if distasteful) actions is ridiculous – especially coming from a group who have just enjoyed using the freedom of speech of a Western country to stage a peaceful demonstration but seem to think it is okay to ignore someone they disagree with’s rights to freedom of speech and demand their arrest to shut them up. Not an unusual state of affairs when it comes to religious protestors of any type – witness the Christian ones here over the years who demand stage shows or films they dislike are banned or performers or writers arrested, happily invoking the rights to freedom of thought and belief for themselves while finding it so easy to demand its removal from others. Religion. Should be a law against it. Meanwhile I can’t help but notice that no-one, be it on this militant fuckwit American church side or the usual flag burning Muslim countries side, has commented on the worst aspect of this whole proposed book burning – I mean, just what is that going to do for their carbon footprint, eh? I’m thinking the few remaining, book reading, civilised people should have a counter demonstration against both side and wave some oversized copies of Ray Bradbury’s Fahrenheit 451 at these numpties.